You are fascinated by ideas. What is an idea? An idea is a concept, the best explanation of the most events. You are delighted when you discover beneath the complex surface an elegantly simple concept to explain why things are the way they are. An idea is a connection. Yours is the kind of mind that is always looking for connections, and so you are intrigued when seemingly disparate phenomena can be linked by an obscure connection. An idea is a new perspective on familiar challenges. You revel in taking the world we all know and turning it around so we can view it from a strange but strangely enlightening angle. You love all these ideas because they are profound, because they are novel, because they are clarifying, because they are contrary, because they are bizarre. Finish your thoughts and ideas before communicating them. Lacking your Ideation strength, others might not be able to "join the dots" of an interesting but incomplete idea, and thus might dismiss it. 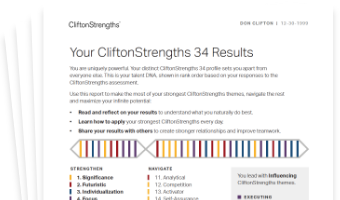 See how Ideation shows in your CliftonStrengths results -- discover All 34 CliftonStrengths Themes today!